Felix Rosenqvist was in contention for another Formula E podium when the first race of Montreal’s double-header finale took place on Saturday, but dropped down to tenth on the final laps after a late brush with the wall. 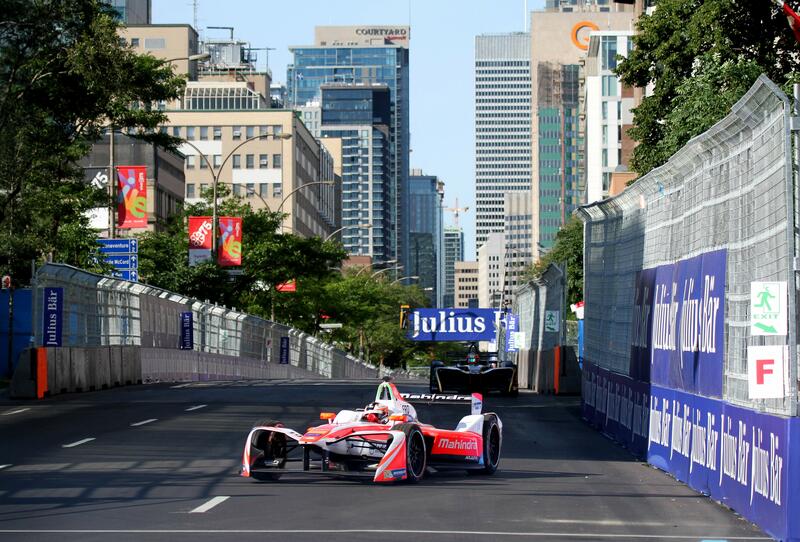 On Formula E’s first-ever visit to Canada, Rosenqvist was immediately on frontrunning pace, making it through to the top five Super Pole cut in qualifying and lining up third on the grid for the 35-lap race. The Mahindra Racing Swede maintained third place throughout the opening stint, sandwiched between Techeetah pair Stéphane Sarrazin and Jean-Eric Vergne, but lost one spot to the latter in the pit stops and rejoined in fourth. A late safety car period then ensured a dramatic conclusion with the field bunched up, and at the restart, Rosenqvist put Sarrazin – who’d previously been passed by team-mate Vergne – under big pressure for the final podium position. With just five laps to go, however, Rosenqvist glanced one of the Montreal street track’s many unforgiving barriers, damaging his suspension and making him easy pray for his most immediate pursuers. Despite being forced to nurse his Mahindra Racing M3Electro across the line, Rosenqvist clung on to tenth place, salvaging the final point on offer as the battle over third in the Formula E standings intensified further still. With just one final race to go in the all-electric series, Rosenqvist has now dropped behind Britain’s Sam Bird to fourth in the standings – but with just three points separating the duo ahead of Sunday’s all-important finale, drama is set to be guaranteed in the brawl for bronze. Also in contention for the position are Vergne, Nicolas Prost (FRA) and Nick Heidfeld (GER). With one race still to go, Felix Rosenqvist is now confirmed as the 2016-17 FIA Formula E Championship rookie of the season. Sunday’s final leg of the Montreal ePrix will also see the Formula E title race being settled. UPDATE: Following the race, Sébastien Buemi’s second Renault e.dams car was found to be below the minimum weight requirements. The stewards duly disqualified Buemi, who had finished the race fourth on the road, elevating Felix to ninth in the final classification.